Pressed by dozens of residents during a Facebook Live town hall meeting this week to take a position on a proposal to build a medical marijuana dispensary on Adamston Road, Brick Mayor John Ducey said he is legally bound to stay out of the discussion. “If I’m found to influence the board, it’s ethically wrong and morally wrong, and people find themselves in very hot water – going to jail and what not, about influencing a board,” he said. An elected official taking a position on an application pending before a land use board has been construed by courts in New Jersey to be akin to inappropriately using one’s office to influence a board’s decision. One of those cases even originated in Brick, with negative comments from a former councilman contributing to litigation that resulted in the reversal of a decision against granting a variance for a church to occupy a strip-mall storefront that was largely considered to be too small. Brick was forced to allow the New Beginnings Christian Fellowship church to occupy the space and pay the church $237,500 as part of a settlement. 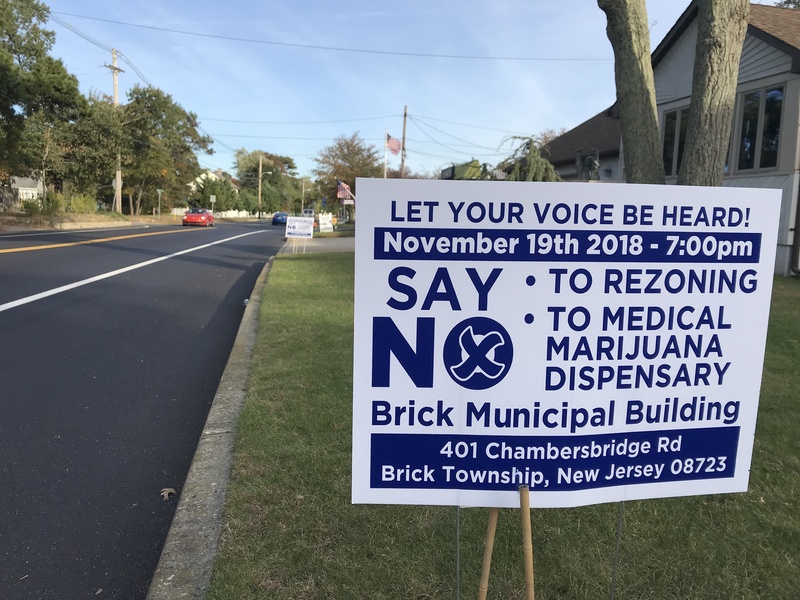 The proposed medical marijuana facility at 385 Adamston Road requires a similar variance since dispensaries are not a permitted use in any of Brick Township’s zones. The project will convert a former bank building into the dispensary itself and the owners will build a 48,000 square foot grow house on the rear of the property. The application before the zoning board has generated heated controversy, most recently leading to a proliferation of signs on neighbors’ lawns opposing the proposal. Ducey was peppered with questions during the Facebook Live session this week. Use variances, also known as “D” variances, are among the toughest for an applicant to obtain. A developer must meet state-mandated criteria to overcome established zoning. The proposed location of the dispensary is located in a residential zone, though the plot of land on which it sits has been used commercially since the mid-1970s. The first hearing on the project did not result in a decision since the case was not completed by the end of the zoning board meeting. A new hearing has been scheduled for Nov. 19, however there is a chance that hearing may never occur. The dispensary, which would be known as Jersey Shore Therapeutic Health Care – a spin on the acronym THC, the psychoactive chemical in marijuana – must be one of six applicants to be licensed by the state out of more than 100 that applied. On Nov. 1, the state will award licenses to two businesses each in the northern, central and southern regions of New Jersey. “That may take care of the whole situation because you have to be one of the six people out of 147,” said Ducey. According to the state Department of Health, applicants for medical marijuana dispensary licenses must, by law, have a plan to receive local zoning approval by Nov. 30 to qualify for the license. That secondary deadline further complicates the case and places more pressure on the zoning board to wrap up the hearing on Nov. 19, since there are no additional meeting dates available until Feb. 2019. The JSTHC facility would serve medical marijuana patients only and its owners have said they would accept a restriction that, if recreational marijuana were to be legalized in New Jersey, the site could only serve medical patients. In theory, the business could go back before the board to ask for the restriction to be lifted in the future, though Anne Davis, one of the two co-owners of the property, said she is looking to conduct research and other medical-only activities at the site that would preclude recreational sales. Residents have argued that the facility could diminish their property values, add traffic to the neighborhood, be subject to an increased robbery threat and lead to patients smoking marijuana in their neighborhood, since smoking is not allowed on the premises. They have faced off against medical marijuana activists, who have said there are rigorous rules for being accepted into the state’s medical program and that the facility would generate less traffic than the bank and a reduced robbery threat. The Nov. 19 meeting will be held at 7 p.m. at the township municipal complex.